What is it with these men on True Blood? Alan Ball was so right when he talked about Sookie and the parade of hot guys. And they are all so talented as well! Meet Jim Parrack, the young Texas born actor who portrays Hoyt Fortenberry on True Blood. Hoyt is the cute momma’s boy who is not allowed to drink more than one beer and who gladly accompanies his mother to baby showers. But there is more to him than that and his world is about the change in the upcoming season. From episode synopsises we have learned that Hoyt is about to meet Jessica and that can only mean one thing: Trouble. Before landing his recurring role on True Blood, Jim Parrack was seen in the movie Annapolis and made guest appearances on tv shows like Monk, ER, CSI, Grey’s Anatomy, Navy CSI, Criminal Minds and Supernatural. I asked Jim about how he sees Hoyt, about his experiences on the True Blood set, his aspiration to direct and his view on the Fellowship of the Sun Church. When did you decide to pursue a career in acting? Which actors did you look up to and influenced you? “I always wanted to act. I don’t think I felt like that was something that could be admitted when I was growing up, so it took a little longer for me to say outright. But at the end of my junior year of high school I gave up golf and told my parents and a few friends that I wanted to be an actor. I think it surprised most everyone, and no one seemed to hold back much on what they thought of it. I don’t blame them for a second. Robert Duvall had my attention when I was eight. He did the classic Texas Western in a miniseries called “Lonesome Dove”, I was hooked. It’s as good as anything I’ve ever seen since. He’s a friend of mine now and is nice enough to give me advice when I ask. He is electrically into being alive on the earth. He and his wife are wonderful. When did you move to Los Angeles? How does a boy from Allen, Texas adapt to life in LA? When you first read the script of True Blood, did you like it immediately? What did you think of it? Could you ever have anticipated that the show would be so successful? Did you have any interest in the vampire genre before True Blood? Can you tell us something about how you got the part of Hoyt. What was the audition process like? What do your family and friends think of your recurring role on True Blood? Do they all watch it? Was it hard to master the southern accent? Do you still think about it with every line you say or does it come naturally at some point? What is it like working with such an international cast? Have you picked up some Australian or English slang? What does a typical day on the set look like? I’ve seen a fan describe Hoyt as a cute and sweet momma’s boy. How would you describe Hoyt? Do you look like Hoyt? Are you anything like him? Do people recognize you in the street? What do they say? What was your favorite scene to shoot in the first season of True Blood? Did you have any funny bloopers in the scenes that you shot? In the last episodes if Season 1 it looks like Hoyt is finally manning up a bit, telling his mom off and expressing the wish to date a vampire girl. From the episode synopsis for Season 2 we learn that Hoyt and Jessica will meet at Merlotte’s. Can you tell us a little bit about what to expect from Hoyt in the upcoming episodes? Are you working on anything else other than True Blood? Is there anything in the pipeline for you as far as other TV projects / Films / Theatre? You are the president of 120 Productions Inc. What can you tell us about that? What are you personal interests, what do you do in your free time? Do you practice sports? Do you have any pets? “Recently I have very much enjoyed being a husband. My wife Ciera and I can stand face to face in our kitchen and stare into each other’s eyes and talk for three hours without noticing that any time has passed. She is the kind of gal I spent a lifetime day dreaming about. She is an actor and a creative companion. She was given a double portion of talent and lately has coupled that with a work ethic that inspires the hell out of me. When she acts it feels like you’re watching something being poured out of some basin that was filled by God eons ago. She is mesmerizing. So we nerd it up with the acting stuff together. I love to read and watch movies. I play golf. Not as often or as well as I used to. As a Christian, what do you think of the Fellowship of the Sun Church? “It is a spot on depiction of what happens when a group of people want to make God a slave to their agenda or personal code. It is a terrifying reality and my faith is so plagued by this kind of sojourn away from the Gospel message of Christ that it is now hard for the modern world to get a clear view of what that message is. This kind of mentality pollutes a clear view of Christ’s love. How you can derive self righteousness, and self glorification and hatred for anyone who is not as you wish they were from the message and the God that commands you to love your neighbor without discretion and to extend the grace and mercy to others that Christ has extended you, and says in no uncertain terms, “whatever you do to the least of these you do unto Me”, and asks us to forgive no matter the degree of infliction doled out by our offender, I HAVE NO IDEA. It baffles me as much as anything. It pains me as much as anything. The Fellowship is not unrealistic. But it isn’t Christian either. Sookie gets that. Hoyt gets that. I have to wonder if secular America gets that. If they don’t it is by no fault of their own, but by the way people behave towards them in the name of Christianity. Do you check out the True Blood message boards or True Blood fan sites to read fan reactions? I know! I want bloopers! Great interview! And his wife is beautiful. Really nice interview, Shad – so interesting to hear about the different kinds of people on this show! Shad has brought us another great interview. So many of us were hoping that Parrack (Hoyt) would have a larger role in season 2. He’s vulnerable and sweet. His thoughts, as Sookie hears them, are honest and good. We wanted him to rebel against his momma, and it seems we’ll get our wish. I was also interested in how cast members who were Christian, would react to the FOS plot line, and if they saw the parallels to exclusionary sects of Christianity and other religions. The special project mentioned by Parrack sounds interesting. Fans of The Vault always love to read all inside informtion on our favorite cast members (Stephen Moyer)…so thanks for giving us more fodder for our fantasies about out favorite Brit. 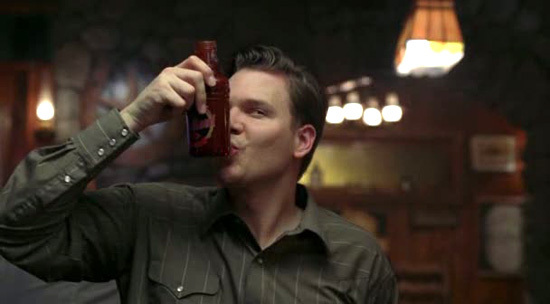 Best of luck to Parrack, and I wish you a long run on True Blood. Watch out for Jessica, though … she’ll drive momma crazy! Another great interview SHAD. I was hoping Hoyt (Parrack) would have a larger role this season and it seems that he will!!! And with Jessica, can’t wait till June!!! Alan Ball really knows how to pick his actors!! he’s adorable and talented. very busy man too. that’s awesome that so many of the cast members are pursuing there own things alongside true blood. can’t wait to see him in season two. and of course, i love what he said about stephen speaking. Great Interview Shad. Congratulations. Playing Hoyt must be so much fun for him. I am looking forward to seeing how his character reacts to Jessica this season from the spoilers I’ve been reading. This is just great! Great interview Shad. You are really batting a thousand with this stuff. I really enjoy Hoyt on the show. His day to day demeanor provides an ordinary person’s view into the show’s extraordinarily dysfunctional landscape. I love this part. “Recently I have very much enjoyed being a husband. My wife Ciera and I can stand face to face in our kitchen and stare into each other’s eyes and talk for three hours without noticing that any time has passed. She is the kind of gal I spent a lifetime day dreaming about. She is an actor and a creative companion”. What a mighty good man. That’s all I’ve got to say. Best of luck to Jim and his lovely wife. I’m loving all of these exclusive interviews, Shad! Great job. I hadn’t seen the pics of Jim from the premiere, he is so cute. I’m really looking forward to the Jessica/Hoyt stuff in season 2. A great interview, Shad! Parrack seems like a very down to earth individual. His wife is stunning too! I look forward to S2 and his expanded storyline. He deserves it. Also, I’m glad that he had good friends and parents to help him stay grounded when it look like things may have been bleak at one point in his life. I’m glad that he adjusted. I love the fact that he loves vampires, the story about college, was priceless. And his comments regarding De-Christing of Christianity. I would love to see Parrack and Ellis do a documentary on that subject. I wish him the best in all of his endeavors. Shad, this is a wonderful interview. What a sweet guy. And so well grounded. I’m looking forward to more screen time and an interesting story line for Hoyt. Sounds like we’re going to get it. Thanks so very much for this. Shad thank you once again for a great interview. You always surprise us. Jim seems like a great guy I love the character Hoyt and I see that a lot of Jim is there. Jim seems so nice and down to earth. His wife is beautiful and I think he is a great actor. I am so glad we will be seeing more of him in season 2 he and Jessica will give us some great moments I am sure. I LOVE LOVE this kid ! Great Interview !!! I love how open, honest and at ease he is to the questions. There is nothing to hide there – everything is on the surface. He’s a good person, you can just tell. He seems as sweet as his charcater Hoyt. Parrack is a great actor, I love to watch him – whether it be in True Blood, ER or Supernatural. I am glad that we are going to get to see more of his character Hoyt next season. I really hope they spice it up and change things around for Hoyt. I cannot wait ! His wife is a GORGEOUS girl! God Bless them both – happy healthy life together! Great job on the interview, I really enjoyed getting to know a little bit more about Hoyt/Jim. I hope the project Nelson Ellis and he are thinking of taking to HBO becomes a reality. It would no doubt be controversial and somewhat politically dangerous but I’m sure they would also find out that many people hold views similar to theirs. This is really a documentary that should be done. Congratulations on another great interview, Shad. Very interesting! What a great interview Shad! I can’t wait to see what the Hoyt/Jessica dynamic may bring this season, and I get the impression it will be something else! I enjoyed hearing Mr. Parrack’s take on Hoyt, on the bloopers, the success of the show, and the potential project he could do with Nelsan Ellis. Thanks for sharing with us!!! i love that you are seeing relationships between the actors develop off-screen. i mean we know about stephen and anna, but it’s cool that people are becoming friends and even working on projects together. they all have the best job ever. i wonder if we will see his wife take a part in the show in the future. Great interview, Shad. Thanks for sharing with us. I’d like to see a documentary on that subject. Not only Star Trek and Buffy are subjects deserving reflection – both academic (it needs more time, but don’t worry) ;) and popular (there is never enough high quality popularization). Wonderful interview Shad. Hoyt is one of my favorite characters on True Blood. It will be interesting to see how he and Jessica’s relationship evolve. I was surprised to read that he wants to film a movie in Madisonville. My mother was born and raised just down the road in a small town called Midway, TX. During our visits there in the summer, we would go shopping in Madisonville. As children, we had so much fun down there in the country as we called it. You should audition then for a part in the movie, the accent should be easy for you. I’m looking forward to seeing the expansion of Hoyt in Season 2. He’s such an endearing character and Jim plays him with such honesty and vulnerability. I’ll be curious to see the romance between Hoyt and Jessica and I also wonder what the outcome of the relationship will be. …..Great interview with a great actor, Shad! Wow. What a great, wonderfully grounded, down-to-earth young man. He should be a role model for any wanna-be actor. He has values and is not afraid to let the sensitive and spiritual side come through. He is indeed a lucky man to have found such a great wife and great relationship. I wish him all the best life has to offer in his chosen profession. I truly look forward to seeing much more of him on down the road. And I am especially sprung over all the possibilities of Hoyt in season 2. Hoyt has such a sweet nature and I’m sure it’s not all acting. Jim’s true nature is shining through. Congratulations Hoyt! You’re gonna love Jessica! Thanks, Shad, for another great interview. You always ask the most interesting questions! What a refreshing interview! Here is someone we have loved, but never got to find out anything about! I like the role as Hoyt played so much because as he said, he is real and giving, the kind of guy you want as your friend. I also enjoyed hearing about his relationship with his wife. One always hopes and dreams of finding someone that sails their ship like Ciera does his. I’m glad he followed his dreams despite not expressing them at first. The shows Jim has played on are all favorites of mine, and I will be searching for the episodes he was in to get a better grip on the vastness of his acting abilities. And I simply cannot wait to see him get some just desserts and bring Jess home to Momma! Woo Hoo! (or maybe HE is the dessert!) Shad, thank you so much, that was wonderful! I’m late commenting on this so please forgive me. Thank You Shad for this wonderful interview. He is such a down to earth person and I love that he is not ashamed to say he is a Christian. I would love it if he and Nelsan could do the project he talked about. How interesting that would be. I’m so happy we will be seeing more of Hoyt in S2. I really like his character and am glad it will be expanded. His wife is beautiful and they look so cute together! To all the people who responded with such lavish praise for this interview, please beware. People who go on and on about religion, God and bliss only raise more questions about themselves. Sorry Jim Parrack, I’m not buying what you are selling. A very surprising comment you leave, Jule. I asked Jim specifically about his believes and that’s why he spoke about it. If I hadn’t had asked there would have been no talk of religion in this interview. Your comment raises a lot of questions and you are answering none. I am not buying what you are selling.